The pace of growth for UK house prices has continued to slow, while property in London had the weakest growth since 2009, official figures showed. The capital had the lowest annual growth, where prices decreased by 0.7%. The Office for National Statistics said in a blog that the decline in London can be linked to changes for stamp duty as well as the Brexit vote. These factors have put off foreign buyers and seen net migration to the city fall, the ONS said. London has seen a fall in demand since mid-2016, when the rate of price growth first started to slow down, said the ONS’s Kishan Rana. Stamp duty reforms and tax changes have contributed to price rises for buy-to-let mortgages, while “perceptions of the future value of London property have been adversely affected” by Brexit uncertainty, he said. In the year to March, average house prices across the UK increased by 4.2% to £224,000, the ONS said. This was £9,000 higher than in March 2017. The annual growth rate slowed from a 4.4% rise in February. Compared with February, prices decreased by 0.2%, or £500. 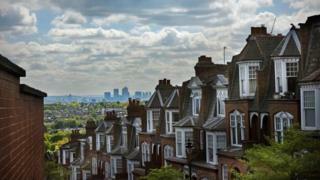 London continued to be the region with the highest average house price, at £472,000. Jonathan Hopper, managing director of Garrington Property Finders, said: “London is paying a painfully high price for its stellar run of price rises, and a correction is now under way in several parts of the capital. In England, house prices increased by 4% in the year to March, reaching an average £241,000. The East of England had the highest annual house price growth, with prices increasing by 5.8% annually. This was followed by the East Midlands, which saw a 5.6% increase. Wales saw house prices increase by 3.5% over the previous 12 months to reach £153,000. In Scotland, the average price increased by 6.7% over the year to stand at £146,000. The average price in Northern Ireland was £130,000, an annual increase of 4.2%.